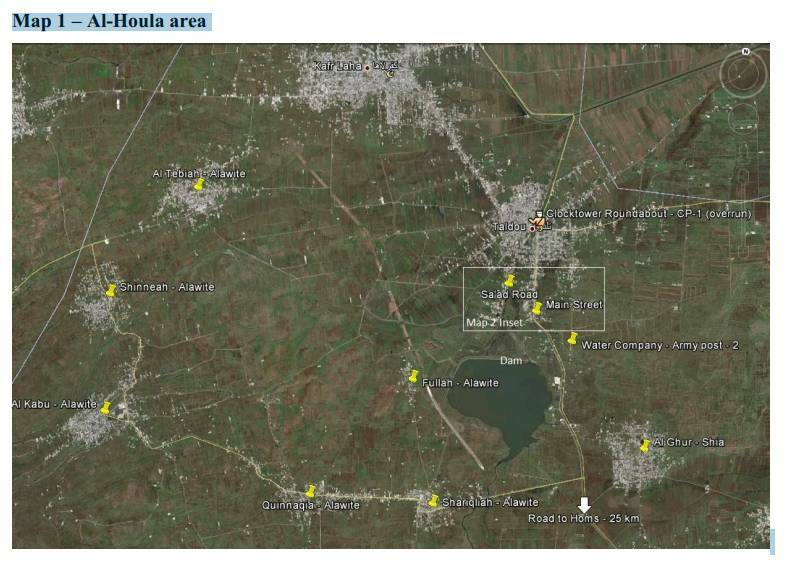 This page seeks to visually understand and explain the scene(s) of The Houla massacre. 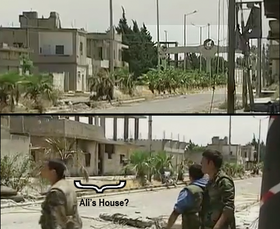 See also the page on the military/security situation as it played out in this scene and in time: Houla, May 25: Who Was in Control? 2.3 North: Military Intel, Another Al-Sayed Home? The following five maps were pre-made and available. The information on them is not always correct. Explanatory notes follow the images. Below: General Taldou attack map. There are many things missing here - its point seems to be adding the things not reported well enough already in opposition-fed sources. Of note, the other Abdul Razaq family in the northwest, the Al-Sayed homes on main street, and the sites of government posts overrun during the supposed government attack and massacre. Many of the placements here seem imprecise, and some of our own findings below will differ. For example, it seems they're calling Main Street Saad Road ('rallying point for Hassan clan'), when that was a bit off to the west (and an area we don't really get to see street level views of -see below). This unusual map was found at this post on the Greater Syria blog. 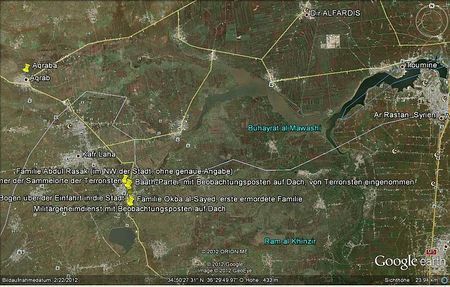 Until we can get a reading on the labels, we can say roughly that the left-most block refers to the Abdul Razaq massacre area, extended to the west, perhaps including more killing sites than we know of. The middle area is south Main Street where the Al-Sayeds were killed. The easternmost block correlates to nothing the rebels have acknowledged to our awareness, but includes the area we think might be the stricken Alawite village of Al-Shumariyeh. What is usually called "Main Street" probably has a different name to locals, but it hasn't come through widely. The UNHRC's Commission of Inquiry, in its August final report, gave the Arabic name for Al-Shar’i Al-Raisi. There is quite a bit of available imagery of this area, enabling a pretty though mapping. The buildings along it are more thoroughly cataloged and assigned reference numbers, based on distance south of the clock tower, in this detailed page Main Street. The text below was written before that, and will in time be partly updated to include the reference numbers, which wil generally run in reverse as we progress north towards to clock tower roughly marking the center of Taldou. The UN Special Mission in Syria observers made at least two visits to Al-Houla/Taldou on May 26 and May 27, posting two edited videos on Youtube. The visit of the 27th they were joined by a news crew from UK's Channel 4, including chief reporter Alex Thomson. These videos combined share useful street level scenery from various sites, but especially the stretch between the hospital and the arches. Another Alex Thomson video report (for ITN/CNN) has him embedded with the Syrian Army just north of the arches, it seems, pinned down by unseen rebel gunmen. One soldier is wounded and carried away, leaving a fair amount of blood on the sidewalk. An executed old man was laying nearby, covered with a blanket. The views north of the arches are well-established here. All of these and other videos show in Taldou, at least along main street and as early as the morning of May 26, what seems to be a total ghost town, devoid of any life unattached to a gun. Something heavy happened here. It left buildings riddled with holes, belching smoke, walls knocked out, perhaps by near-range rocket attacks. Debris and light poles lay across the marred streets. The palms in the median have been largely mowed down by heavy gunfire. Government soldiers can access the city but come under fire. Prior to May 25, this was ostensibly a government-held town. After the massacre, allegedly by government forces, government posts were largely overrun and the city made into an uninhabitable no-man's land. A major landmark on Taldou's "main street" is the Qaws, or arches, marking the original entrance to the city but now laying halfway from the outskierts to city center. 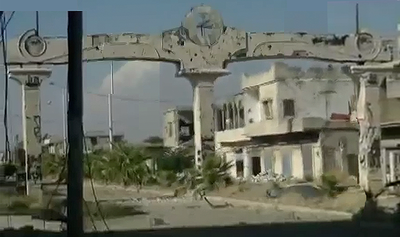 An amateur video from just south of the arches, apparently filmed by opposition activists much later, in September, shows a more rubbled scene than before, with nearly all the buildings around destroyed by shelling/rocket /mortar fire. From this video, a stitched view of the arches themselves. The arches were reported as the general base area of the mobile Qaws security post, which supposedly made main street impregnable to rebel outsiders. As the UNHRC inquiry decided, from its August report, "The commission has since determined that the checkpoint at Al-Qaws, which is closest to the Al-Sayed house on Main Street, remained in Government control on the day of the incident. 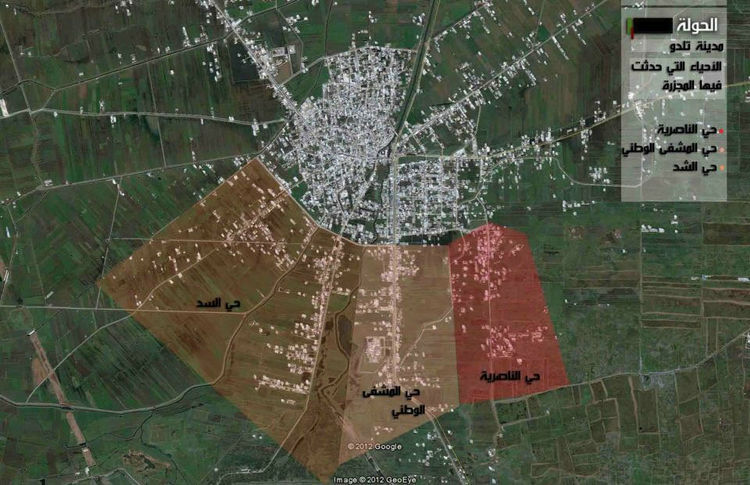 The front line between the opposition and Government forces was north of the checkpoint." (paragraph 45, p. 11)  Yet the arches there - the south face of them - are evidently shot to hell in that later video, and also apparently on the day after the massacre (if to a lesser extent). That can be seen as the UNSMIS observers filmed their entry through the arches the 26th, from the south, stitched into the view below (seen through the windshield). . Bullet holes are present, although the lighting isn't terribly clear. Interestingly, the angle of sunlight suggests this is not their first entry at 11am. Rather, this seems to be a late afternoon drive, but by the editing, arranged first. In both views, something is missing, apparently torn down, from the upper center of the arches structure. It may have been some sort of crest, presumably sporting the Syrian national colors, red, white, and black. Also visible is some kind of black graffiti applied to the pillars at some point, then most of it scribbled out again in black before the observers arrived. One small word at the top of the east column seems readable. Note at least one bit of post-May 26 damage, visible in the upper image but not present in the lower one. On the right column, a chunk of concrete is missing right at the top of the black-painted spot. But some of the fighting and apparent changing-of-hands at this spot occurred, apparently, at about the time of the massacres on Main Street, despite what the UN inquiry decided. However, some of the graffiti across town, notably on the clock-tower, was there at the time of the February 2012 satellite images used for Google Maps. And even further back, in September 2011, the arches have already had the crest torn down and at least some graffiti placed and marked out. 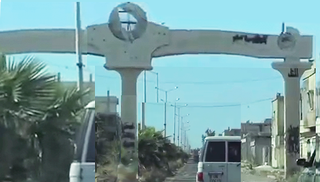 This video shows the arches from the north looking south; the shade makes it less than clear if it's already marked with bullet holes as it was after the "shelling" of May 25. The point of the video was to show the power lines downed by the destruction of a pole a little north of there, allegedly due to government shelling. The two acknowledged Al-Sayed households that were massacred lie on main street, north of the national hospital and south of the arches. Channel 4's video shows the road from further south than the monitors' video. No one, to our knowledge, has filmed the actual hospital, reportedly also an army post that was stricken, violently cleared of people, and burned. However, the edit starts just in front of the hospital, taking in its shrubbery and the base of the water tower just north of it (visible at left, top frame). A group of large trees in front of a home, the beginning of the divider, and a left turn coincide in the lower frame, as they do at the north end of the hospital grounds. 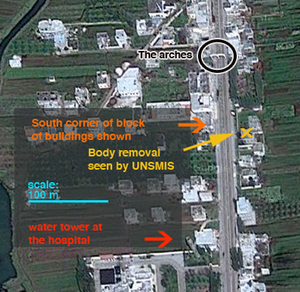 By the labeling of the UN commission, above, the southernmost Al-Sayed massacre site is exactly behind those trees. Note for reference the arches over the road, visible in the distance (too far to include on the map at right). This map shows what the colored arrows above mean. The yellow x is the building the video is shot from, on its north side. The red arrow for the water tower here is a bit orange, sorry. The composite at right shows another truckload of bodies removed, being loaded on the 27th, a very windy day. This scene is behind the low outer wall, but the building across the way is clear. This is the same location they keep being brought back to. There will be some further notes on the bodies found in and around that house where, it turns out, several people did some filming and at least one woman was thought to be both raped and killed. 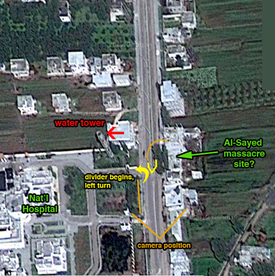 North: Military Intel, Another Al-Sayed Home? The area immediately north of the arches was well seen by at least two videographers in the days after the massacre, as the military struggled to maintain control. One was published with a report from the UK Times, with good resolution (who filmed it, when, etc. - details forthcoming). Alex Thomson, in a video for ITN/CNN, was pinned down there with the Syrian army by unseen opposition activists hidden in the empty homes. More devastation is evident to the street and all buildings facing onto it. As the camera pans down the street, it spies the arches - shaded backside, suggesting north, different graffiti pattern, and the distinct tear in the center crest is inverted (top view at right). Therefore, they're north, looking south. As it pans across the street, it sees the spot captured at right, bottom view. This is clearly the same spot given in a recent France 2 documentary as the attacked home of ridiculously inconsistent alleged miracle survivor, 8-11 year-old Ali Al-Sayed, as shown below. This then would be the home headed by his father, Ali/Aref/Shaoqui (depending), where 5-8 people were killed as Ali played dead, after exactly five shots were fired through the door lock, and before the vacuum cleaner or washing machine was stolen. Add another twist to his incredibility - if that's the house the government-allied Shabiha attacked around 4 am, why didn't he mention the major fire-fight this area has clearly witnessed? The building next to it, just south with four "fins" sticking out, helps place it. Near there, according to the UN CoI maps above, is the headquarters of military intelligence. Their own map notes it was "likely overrun" by rebel forces at about the time of the massacre. This area too has been plenty seen. The UNSMIS monitors filmed a burnt out, sandbagged, armored vehicle in front of it. Activists with guns filmed themselves posing in front of it a month later. 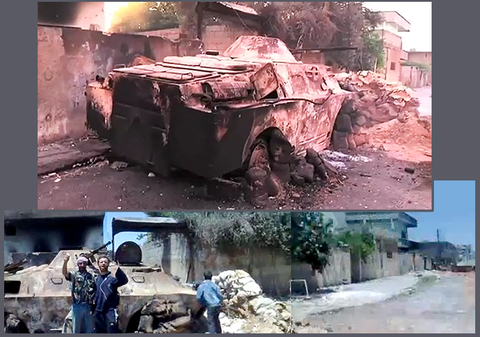 Even if this APC was so damaged in a battle prior to May 25, it's noteworthy and has gotten little note-after the supposed Shabiha rampage and government shelling with weapons only they possess, some of the weapons they possess were blown up, burnt-out, and abandoned. This rebel video has a useful circular pan, partly conveyed above, that shows a gap in the road median right in front, building heights and spacing, and a big tree that clarify where we are. 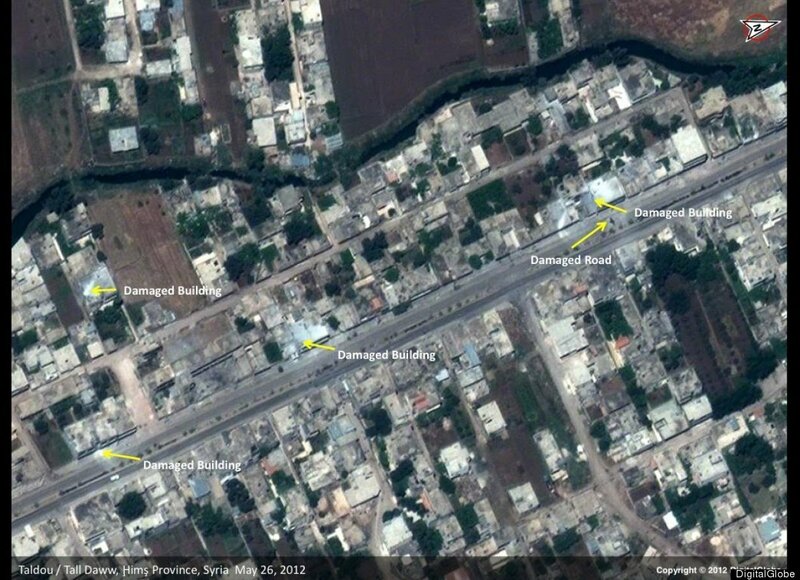 (on Google maps), where the two blue APCs can be seen parked in February. The building France 2 showed, from that same useful pan, should be the building next to the one with four ridges/fins. as it is, and as labeled at right - about 50 meters from the overrun HQ. Now... what government forces were supposed to have protected that home from any alleged terrorist invasion? Update: While it helped further the space analysis, this house identified by France 2 is not Ali's house. He referred to, and led activists to, a place south of the arches - the same one the UNSMIS monitors observed the removal of bodies from. This is also, coincidentally, the family of Aref Mohammed al-Sayed, related to the parliament secretary, per SANA, etc. (see here for details). And further north yet, another area just south of the center of town where less seems to have happened. This stretch of main street was selected by the analysts at Digital Globe and/or the Huffington Post as one of two spots to focus on. 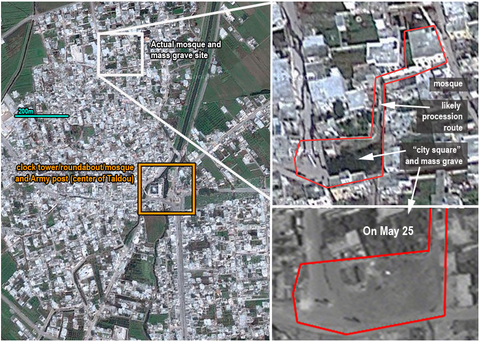 Inspecting imagery from May 25 and May 26, it was announced "Syria Massacre Captured By Satellite Cameras." Bypassing all the overrun military posts and massacre sites, they looked at the mosque and mass grave site (see below), as if that was ever in contention. Sure enough, you can see it from space in this image. 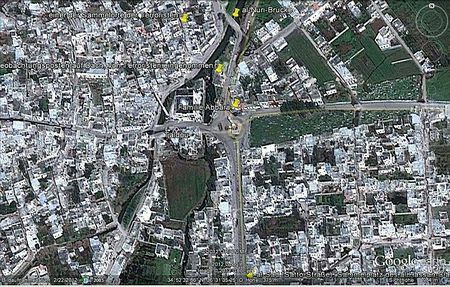 As the report said, "The satellite images "shed another light on some of the atrocities occurring all through Syria," said Stephen Wood, vice president of the DigitalGlobe Analysis Center. "It provides transparency and awareness that would be impossible to provide otherwise" in a country that has closed its doors to independent, foreign media. They identifed the "town square" and "city mosque" - incorrectly -on this slide. In fact, those are actually here, not as they say up here where rebels had made their own imitation city square. And they looked, in this slide, at this less important stretch of street (see inset). Even here, the damage from the alleged government shelling, seen from a tell-tale, eye-in-the-sky angle, is almost exclusively to those buildings facing onto Main street. In fact, the damaged buildings are on the west side, apparently hit on their east-facing outer walls, as if fired on from the east at street level (three damaged buildings and street damage, red squares). Also, they flank the intersection of Main and Satto road. This is interesting in that rebels with RPG launchers were seen running west down what one participant described as Satto road, and firing at least one rocket at a target to the south, as well as perhaps across the street and to the south (see here). They were apparently aiming at the intel headquarters (just outside the box at right). 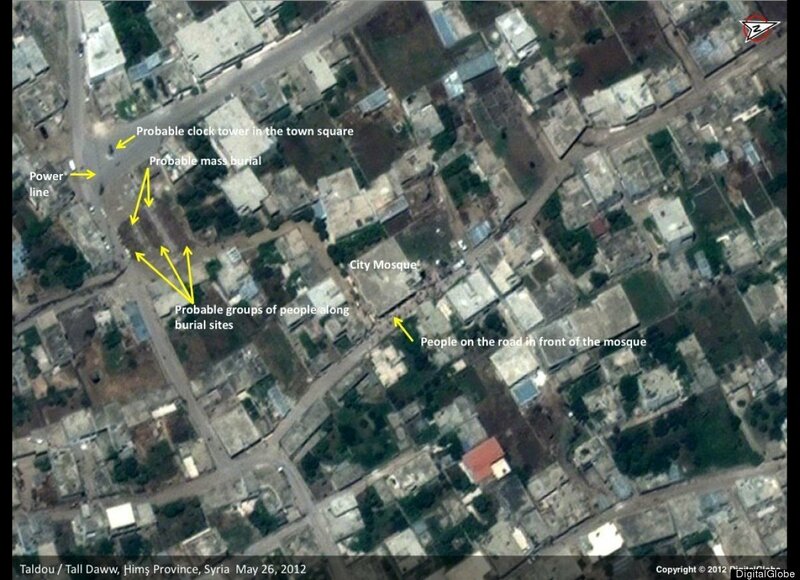 The building and street damage just north of Satto Road might be fired from there too, or just as likely fired from the north, by rebels advancing south past the central checkpoint (the blue arrows are general directions of rebel attack). So, of all the areas in Taldou they scanned before deciding on examples, one can only guess just what it was about this part of main street that made it such a good example for them to focus on. It might be that it looked least like a rebel attack, but even here we can see it's at least consistent. The consistent picture for hundreds of meters down Taldou's main street is one of devastation. It could have been the Shabiha, allied with the controlling government, who blasted their way up the street with heavy and light machine guns, RPGs, short-range mortars, and the like, or mimicked that effect somehow with distant artillery. Or it was rebel forces who stormed town that did all this. Whoever it was, they seems to have a thing for both overwhelming government security posts, and a thing for slaughtering men, women, and children with great cruelty. A dispatch for Channel 4 from chief reporter Alex Thomson was the first news media coverage from Houla/Taldou. 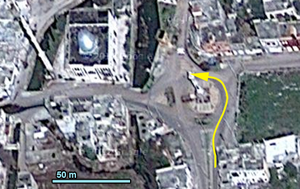 Apparently with UN monitors on May 30th, his crew entered "rebel-held Houla" from the south, taking Main Street up north, to the clock tower roundabout leading to the center of town. The tower, its clock long-since knocked out, is covered with more black graffiti saying, now, absolutely nothing, but saying it boldly and densely. The Google Maps imagery used here, apparently dated February 2012, shows the same patch of black back then, so it's no clue to this crime and the rest of the ubiquitous scrawling is likewise questioned in relevance (but still noted). Thomson notes a "dead horse" in the road there, looking much more like a goat, actually. The animal seems to have some kind of red fabric, a rug or something, tied to its back, a trail of blood where it was dragged out almost into traffic. This is visible on the right side of the stitched panorama of the clock tower in the near-distance. At the bend just past the clock, "abandoned" armored personnel carriers, two blue, one camouflage, and a tank are seen, all left by the Army when they apparently lost this post. Note also the possible rough painting of a goat on the wall between the APCs. "We'll cut Assad's throat," the crowd of people chant on arrival somewhere near this spot. Something between a scapegoat, in the historic sense (with special roots in ancient Syria, by the way), and an animal sacrifice, is suggested, with the goat representing "Assad" (the Syrian government). The large mosque with the dome is called Al Shohada mosque. Its dome was damaged by shelling likely sometimes later. This video shows the shelling, this video shows the damage, both were uploaded in late July 2012. An earlier view of June 1 shows minor damage to the the dome is there already, and also presents a useful view of the whole area. 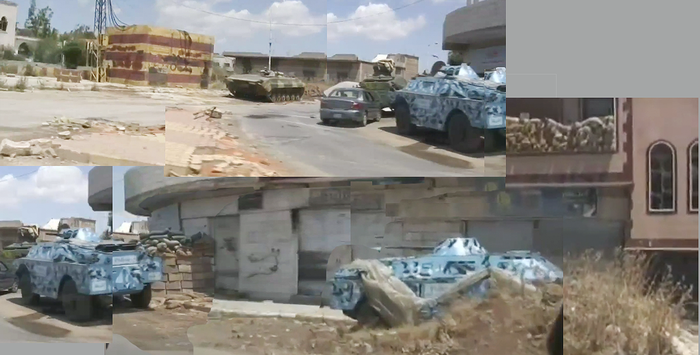 There are some photos on Panoramio of this intersection from June 2012 with some additional battle damage , uploaded by user houla graphic. Some overall scenery by rasslanr also help establish the scene more clearly. 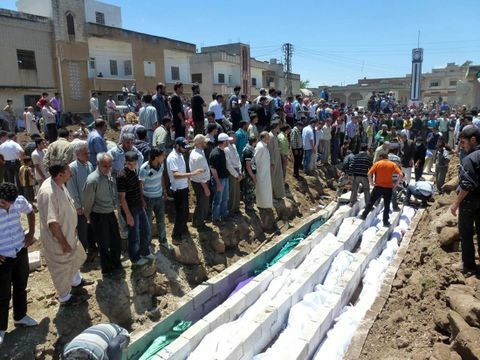 The opposition-run mass grave was said to be in the town square next to the "City Mosque". But contrary to reasonable impressions, this wasn't the evident center of town, described above. With its massive mosque set just off a major roundabout intersection, with a large derelict clock tower, this is where Alex Thomson's video cuts, on a turn to the west, almost as if pulling into Al Shohada mosque. But they must have continued driving right past that splendid structure to the actual site northwest of there - Ali Bin Al Hussein mosque, built some time between 2007 and 2010, according to the sequence of Google Earth satellite imagery. 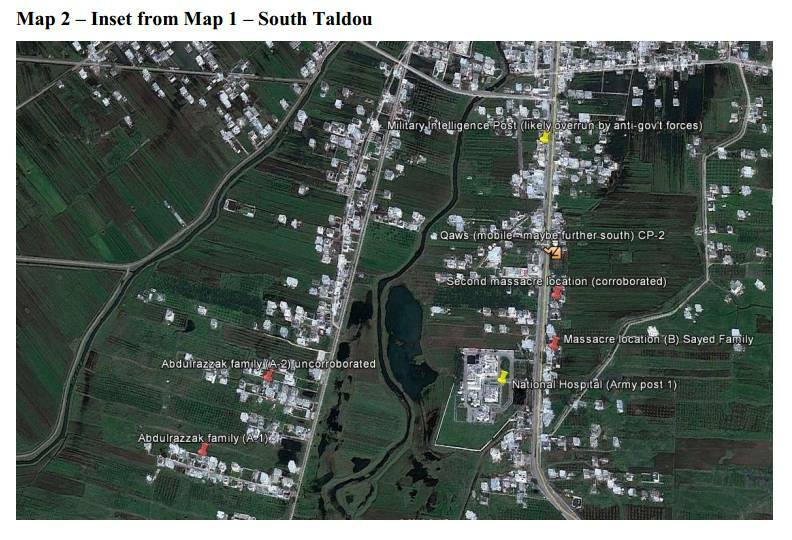 Satellite images published by the Huffington Post show two sections of Taldou as seen on May 25 and May 26, analyzed by the people at Digital Globe. One is the area of the mass burial, the lower right image in the composite at left. As shown there, the images are rotated nearly 90 degrees clockwise, corrected to true north (roughly) here. It was said at the Post that these "provide stark evidence of last week's massacre of more than 100 civilians, many of them children, believed killed by government forces loyal to President Bashar Assad's regime." Of course, that many people were buried should do little to bolster said belief, when no one denies that. The area is identifiable on Google maps, as shown in the rest of the composite. It's further north-northwest of the city center, in a low-level, archaic-looking residential neighborhood, as the site imagery all suggests. Note that the upper satellite image is from February 22, 2012, and shows the mass grave lot occupied by vegetation and a small building that were both removed prior to May 25. It's possible they were planning something like a neighborhood park there, or preparing a mass grave (expecting a government massacre, no doubt). 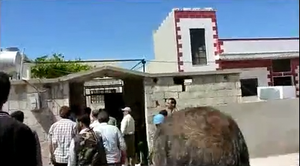 The UN Monitors made a video of their May 26 visit, showing the entrance into Taldou up Main Street, their visits to the home of Aref Al-Sayed to observe the recovery of the dead, and their visit to the mosque and mass grave - a couple of other peripheral movements that were documented help establish the broader scene. When the UN monitors arrived on May 26, at least one of their trucks was escorted the long way around town to reach the mosque. This isn't widely shown, but one opposition video of the day, at least, shows a stretch of it. Filmed from the back of a motorcycle, there are other bikes up ahead, some flying the rebel flag. The slight bend they pass, as the road crosses a creek, seems to be here on Google maps. The trees don't look like trees here, but the number is about right, and all other details (open field to the left, placement of homes and streets, etc) match perfectly. The map at left shows the overall route, everything before that stretch presumed. The arrow head is however set about where the video ends. The rowdy entourage continues east-northeast on the road, passing the first two right turns. At the third one, many of the rebels on their motorcycles, and one white truck presumably with dead in the back (comparison to UNSMIS video forthcoming), turn here, while the monitors continue on, along with a few rebel motorbikes. The driver of the one the cameraman rides on stops, looking confused, and the video cuts. The fourth turn would be the most direct one to their mosque, where most of the bodies were processed, and this third on the best to get to the 'freedom square' clock tower and mass grave site. At some other point, they went out apparently to the northeast of town and filmed it from a distance. Smoke rises from at least two spots that are hard to place. This is at the end of their second day's video for May 27, but apparently edited out of sequence, filmed earlier in the day than the previous shot. And at some other point on that second day, in a scene they didn't include, they monitors were taken to South Saad street, as seen in an opposition video published by ALHula on May 27. Here, they've parked near the Abdul Razaq crime scenes, but just on the main street, at this location. (2:17-2:30 shows the best camera pan for clarifying the locale). Here they met with rebel fighters, dated May 27. Detailed information about the Abdul Razaq crime scene is scant at the moment. The location has been pretty consistently described as along Saad road in Taldou's southwest. The ANNA witnesses describe an Abdul Razaq home in the northwest of the city, but this isn't supported by anything else, those witnesses differ on the victims count, and even the location of Saad road seems to be not definitely verified (it's given on one map asthe name of Main Street, although this could be an error of the creator of the maps depicting the location according to the testimonies of the ANNA witnesses). 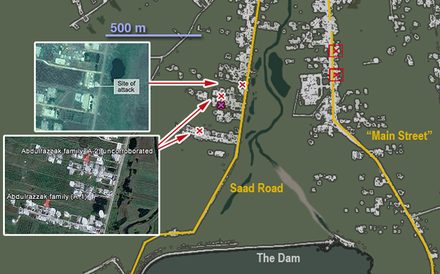 The graphic at right shows both major massacre roads and areas. 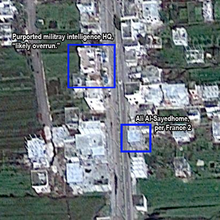 There are two red marks on Main Street, for reported Al-Sayed massacre sites, for reference. The four marks on Saad Road indicate different spots either reported, or of interest. Of the red marks, one is as reported by the BBC, as reported to them (top one, satellite view) and two marks per UN CoI, as reported to them, the southernmost one given as verified. 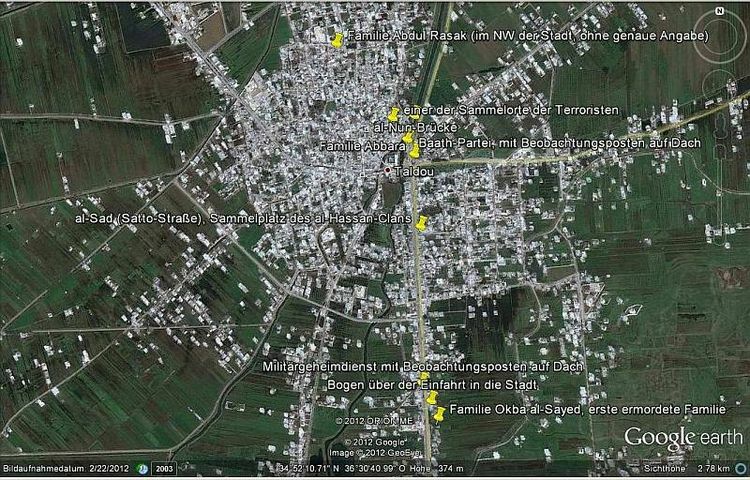 As we'll see below, that mark indicates at least three stricken homes quite near each other. 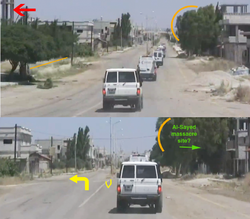 The purple x is set by visual verification from a video, although it's not certain this is a massacre site (explained below). The UN Monitors made a little-noted visit to this part of town, apparently on heir second expedition of May 27. They can be seen on a video of that day, parked on south Saad Road, being flooded by locals fleeing across the fields with their children in order to speak with them. The camera pan at 2:17-2:30 is what clearly established the location as this, on Google maps - the lonely building and next row of homes (alley 1515W, see below), the forest, the dry spillway the camera looks right down, then the forward Army base and so on. Scene 4 in particular helped place itself on the map, in the center here on Google maps, crossing that street from the home south to the gate north, into the home on the left within that wall. The north side home and its neighbor are recognizable from satellite views by shape, even without the red trim coming through. The view to the east, as seen at 2:28 is a perfect match. The street here, extremely narrow, is what we're calling alley 1515W off Saad street. just south of where the monitors would meet locals as described above. It's at about the lower red X in the map above, which now needs updated. Judging by the shadows, the home visit came a little earlier, around 3:17-3 :23 PM. In most of these homes, the most consistent pattern is a number of people executed in a living room, while seated on their low Arabic couches. Clearly they would have been ordered there by the attackers. The homes on alley 1515W, unlike on Main Street, do not show outward signs of heavy weapons fighting; no shelling marks or bulletholes, and no visible burning either. But still it's hard to imagine a family just sitting there in each home even as the gunmen entered the room and fired. 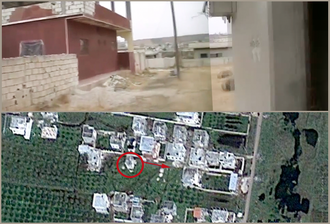 A video tour down the alley was posted June 10 by Abu Usama Al Houla. It shows the south-side home at 2:19 and the gate of the north one at 2 :09-2 :16. At 3:17-3 :23 we see the veranda and ornate white gate and treed courtyard at the east end of a home on the south side of the street. The veranda glimpsed offers a perfect match with the site shown in video #1 (house 1525W+160). On the front porch area is an unusual sight - someone executed solitarily outside the home, a pool of blood dropped there and left with a sandal (see inset). Major Jihad Raslan might have referred to this place when he said to Der Spiegel Mustafa Abdul Rassak was found gravely injured on "the veranda" but barely alive, "beaten at close range with a sharp object. His head had been partly fragmented. … I told him he should recite the declaration of belief." Videos 2 and 3 are not clearly placeable, but both make most sense in this same area. 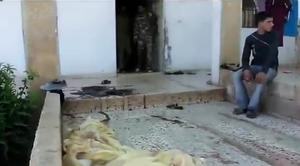 Video 3 is particularly upsetting, showing a side-room just coated with blood. A throat was slit, perhaps, against one wall (no gunshot spray, at any rate), and others bled quarts in far corner, with more blood smeared all across the floor of the large room. "Akrama Bakour, Free Syrian Army" told the BBC by phone "Abdul Rahman Abdul Razaq lost his wife, his five daughters and 11 grandchildren as well as his six daughters-in-law and four of his sons.... This massacre was of 27 people in the same room." If there's any one room that visually recommends itself to be the one, this is it. Video 5 is not placeable here either, and in fact seems to be in another, more built-up part of town (see the exit sequence at the end). It features a dead bull in a small barn, and a large, spacious home with little or no blood seen, but signs of ransacking. The end of the later video tour leaves the viewer near the entrance onto Saad street, looking out across the fields. At the end of alley is another possible dead bovine on the left (4 :26). In the distance, burning orchards can be seen near the water tower and what might be the Alawite village of Shumeriyeh (4 :18-4 :21). 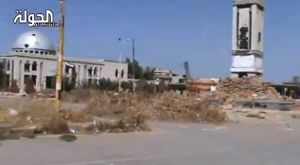 After the massacre committed by regime forces in the Houleh area in late May 2012, most residents fled the area or were killed, leaving it completely abandoned. This activist tours one of the homes were residents were brutally murdered, and the extent of destruction and looting by Al-Assad forces is clearly captured in the footage. It shows activist Jalal Abu Suleiman entering the vacant home, explaining how the Army "will surely kill us if they find us here." The home is drab concrete, looks small, its onetime contents are mostly gone. It’s said these people were massacred, not among those who just fled the shelling. But they were certainly singled out for extra attention in that regard, and it left its marks, as the host points out – strangely horizontal ones. Heavy artillery shells "which rained down on this home" seem unlikely to poke small holes like these straight through the walls. A heavy anti-aircraft gun or maybe grenade launcher out in the street is more likely. The location is established by the camera’s movements. It seems to be the littlest house just outside the walled area, roughly dead center here. The camera scans over the brick wall and yard next door, its pause for the house’s red wall, slight continuance, then a view to the east across the valley with two fenced hoses ahead, and then a small gray place to the right. It’s very near one of the UN’s pins, but not exactly the same building is suggested – theirs seems to be exactly opposite the walled area from here. It's in the cluster of homes north of alley 1515W, where the homes were apparently not blasted. 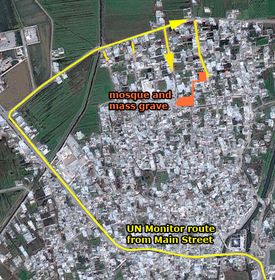 This is the area the UN monitors weren't taken to, and didn't verify. ↑ Houla, Autopsie d’un MassacreFrance 2, Envoye Special, Sept. 20, 2012. ↑ Message from Ambassador Ford on June 1, 2012US State Department, Human Rights.org, June 1, 2012. This page was last edited on 12 May 2013, at 02:17.